Appearance: Dark copper with some necklacing. Nose: Alcohol, bubble gum, leather, rose petals, lavender. Not too different with water, a bit clearer. On the palate: Medium bodied. Burn, candy, caramel, roses. With water it becomes big and sweet. Cotton candy, rose hips, oak, grape soda. Finish: Evaporates quickly off the tongue leaving a soft leathery flavor, some fruit punch and a lot of burn. Fruitier and more delicate with water. Parting Words: About twelve hours after writing up these notes (right after I opened the bottle) I did a comparison tasting against the 2012, of which I have several bottles. The 2012 was a different mashbill but the same yeast strain and a year or so younger. There are clear similarities, but big differences as well. The 2012 I tasted (52.6% ABV, SN/81-3i) was much more balanced and desserty (if that’s a word) with loads of caramel and similar flavors. The comparison also brought out a capsaicin note in the 2013, similar to ghost peppers or habaneros. I didn’t think the 2013 fares well in comparison to the 2012, but I do like it better than the 2011 I had and the 2010 100th anniversary bottling (cue Whiskey Wonka). The 120th Anniversary Single Barrel (2008) is also OBSK but it’s been so long since I’ve had it that I don’t feel comfortable comparing the two. In summary, the 2013 Four Roses Limited Edition Single Barrel is a very good bourbon but not as good as some of its predecessors. Not counting the 40th (2007) and 120th anniversary for reasons of memory (see above), I would rank 2013 squarely in the middle of the pack of Four Roses limited edition single barrel releases. Being in the middle of that pack is better than being at the top of any other pack, though. The Michigan state minimum of $80 is high for a bourbon of its age but given the high proof, unchillfiltering and the unmatched quality of Four Roses across the board, it’s worth it. 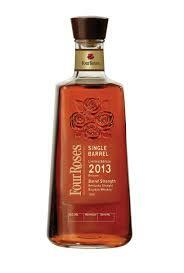 Four Roses Limited Edition Single Barrel, 2013 is recommended.